Batavia is a suburb of Chicago. 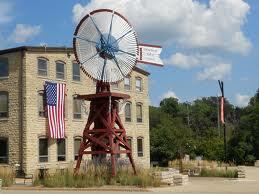 It was founded in 1833, and is the oldest city in Kane County with a small portion in DuPage County. During the Industrial Revolution, Batavia became known as ‘The Windmill City’ for being the largest windmill producer of the time. Batavia is home to Fermilab, a federal-government-sponsored high-energy physics laboratory. Batavia is part of a Tri-Cities area, along with St Charles and Geneva. As of the 2010 census, the city had a total population of 26,045, which was estimated to have increased to 26,318 by July 2012. In 2009, Batavia was ranked #56 on CNN Money’s Best Small Towns in the nation. In 2007, Business Week ranked Batavia #21 on a national list of the 50 best places in America to raise kids. In 2011, Batavia was voted by Relocate America as one of the Top 100 Places to Live in America.